What is the Kent and Medway Armed Forces Network? The Kent and Medway Armed Forces Network (KMAFN) is a multi-organisational group which includes members from the NHS, MoD, Armed Forces Reservists, Mental and Physical Health Clinicians, the Royal British Legion, SSAFA and other interested charities and organisations from across Kent and Medway (i.e. police and local authorities). The members work together to improve the lives of the armed forces community. The network will also include champions from a wide range of the organisations across Kent and Medway who are advocates for the armed forces community and have the skills and knowledge to support through direct service provision, linking with other organisations or signposting to where additional support could be received. It is managed by the Armed Forces Director on behalf of both Sussex and Kent and Medway CCGs. It has a GP from West Kent CCG as the Chair of the Network. Its aim is to facilitate the CCGs and community in the delivery of the Armed Forces Covenant Commitment. Dr David Chesover has been at Thornhills Medical Practice for 26 years and a senior partner for the past five. He is a GP member of the NHS West Kent Clinical Commissioning Group’s governing body as Clinical Lead for Mental Health. David is also the Chair of the Kent and Medway Armed Forces Network Group. He trained at the London Hospital and has specialised in skin tumour surgery, dermatology, medical law, medical education, dispute resolution and medical ethics. In the 1990s he helped set up Kent’s first GP commissioning group by bringing together all but four practices in the Maidstone and Malling area to try to focus on early commissioning needs and ideas. He said: “I hope you find this website helpful and it offers you access to information and education which will help ensure veterans, their families and carers receive the care and support they require." Kate Parkin is the Armed Forces Director for both the Sussex and Kent & Medway Armed Forces Networks working across all 15 NHS Clinical Commissioning Groups within this footprint. Kate has been providing the leadership for Sussex Armed Forces Network since 2011 and since July 2016 has been working in Kent and Medway. Previously Kate has had significant clinical experience, operational and delivering a complex programme of work through teams, across organisational boundaries, and these include: reviews, strategic summits, multi-commissioner procurements, evidence based case for changes, supporting large public consultations for service reconfiguration and option appraisals and the delivery of change. Andrew Layzell has 45 years military experience after joining the Army in 1971 at the age of 15, he joined the Infantry junior leaders Battalion in Oswestry Shropshire. As a career infantry man, having worked through the ranks, he completed 24 years as a regular soldier undertaking 8 operational tours that included one of 2 year, serves as an instructor at the Royal military Academy Sandhurst and Regimental Sergeant Major of an Infantry Battalion. Since leaving the Regular Army in 1996 he has served as the Permanent Staff Administration Officer for B Company 3rd Battalion Princess of Wales’s Royal Regiment, in this roll he was responsible for all aspects of recruiting, training, administration, welfare, deployment and recovery of all combat reservists in Sussex. Andy was awarded the MBE in the Queens 2014 New Year’s Honours list. Jane Burt’s work for the Network focuses on support and recognition for carer’s and families from the armed and ex armed forces community. Jane has worked extensively in the voluntary sector for services that provide specialist support to informal carer’s including mental health carers. Jane also has significant experience in engagement and consultation. Jane is also a trained Mental Health First Aid instructor and leads on providing this within the Network. 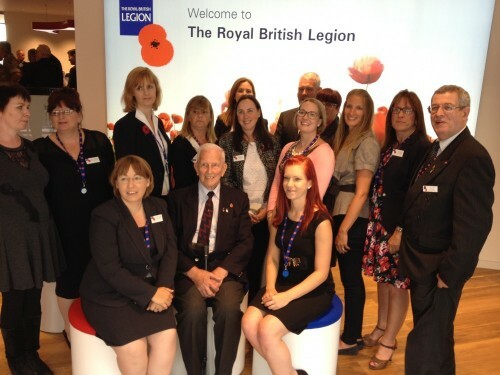 The Royal British Legion South East Area team (pictured) provides practical, emotional and financial support to all members of the British Armed Forces past and present, and their families. Whether it is families coping with the loss of a loved one, help at home to adapt to independent living, recovery centres for injured personnel, money and careers advice or residential care: we are here to help. We actively campaign to improve their lives and safeguard the Military Covenant between the nation and its Armed Forces. Our mission is to provide welfare, comradeship, representation and Remembrance for the Armed Forces Community. The Kent & Medway welfare team can be found at ? ?or can be contacted via the Contact Centre on 0808 802 8080 seven days a week. The community as a whole is better facilitated to provide excellent support to the Armed Forces Community across Kent & Medway. Those who serve in the Armed Forces whether Regular or Reserve, those who have served in the past and their families, should face no disadvantage and receive the integrated care and support they require tailored to their particular needs in accordance with the Armed Forces Covenant. Public and members of the NHS have an awareness of issues affecting personnel, veterans and families. Clear integrated pathways for transitioning Armed Forces personnel into civilian life. There is early identification and referral to the appropriate person, service and place to receive integrated care (including mental health) and support the Armed Forces Community require. Employers support their employees as reservists throughout the organisation ensuring their health and wellbeing.